“The Memphis Blues” (1912), W. C. Handy. “George M. Cohan Medley One Step” (1917), arr. Dave Kaplan. “The Paragon Rag” (two step, 1909), Scott Joplin. “Heart of America” (march, 1909), Arthur Pryor. “Made in America” (fox trot, 1915), M. L. Lake. “In The Hills of Old Kentucky” (medley two step, 1914), Charles L. Johnson. “Aggravation Rag” (1910), George L. Cobb. “Slippery Hank” (trombone novelty, 1917), Frank Losey. “On The Level You’re a Little Devil” (fox trot, 1918), Jean Schwartz. “An Operatic Nightmare: Desecration Rag No.2” (1916), Felix Arndt. “Snookums Rag” (1917), Charles L. Johnson. “Mr. Black Man” (cakewalk, 1904), Arthur Pryor. “Kentucky Home” (fox trot, 1915), Eugene Platzmann. “That Epidemic Rag” (two step, 1911), Harry Tierney & Edna Williams. “Under the Mellow Arabian Moon” (fox trot, 1915), Caspar Nathan & J. Walter Leopold. “That Eccentric Rag” (1912), J. Russell Robinson. “Black and White Rag” (two step, 1908), George Botsford. “‘Old Timers’ Waltz Medley” (1917), arr. M. L. Lake. “The St. Louis Rag” (1904), Tom Turpin. “On Jersey Shore” (march, 1905), Arthur Pryor. This is the Paragon Ragtime Orchestra’s very first recording, made just weeks after the group’s debut concert at The Juilliard School in the spring of 1986. The disc features PRO performing original 1900s orchestra sheet music from the collection of the legendary American trombonist/conductor/composer Arthur Pryor (c. 1869-1942). The Pryor Collection – which Mr. Pryor had used as conductor for the Victor Talking Machine Co. – had been lost since the 1920s. But in 1985 it was discovered by Juilliard student Rick Benjamin, who founded the Paragon Ragtime Orchestra to perform selections from this important historical trove. 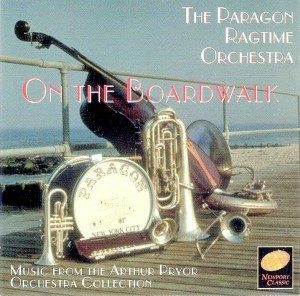 ON THE BOARDWALK includes a delightful mix of Ragtime Era hits along with rarities and revelations (like the original orchestration of W.C. Handy’s first Blues – “Memphis”). Critically acclaimed, this CD was produced by Thomas Frost (a multi-Grammy winner most famous for his recordings of pianist Vladimir Horowitz and The Philadelphia Orchestra under Eugene Ormandy). It is a crackerjack CD – snappily played and beautifully recorded – and the fact that it is still in print after 31 years (an eon in the record business) is proof of its worth. Add it to your collection and enjoy! "...protecting an important American treasure...not just be a pleasure to hear but for many a true revelation."